Featured dish! I know it's been ages, and I thought this segment had run out of steam, but then I had this amazing bagel today and just had to share! Bowery to Williamsburg (or B2W as I'm going to call them from now on, because I'm cool like that), is a new New York-inspired cafe that seems to be exploding in my twitter feed and RSS reader with rave reviews. I instinctively shy away from venues that have a lot of hype (mainly because I imagine there will be crazy queues and poor, hassled or attitudey staff), but I saw that they serve peanut butter hot chocolate (I KNOW RIGHT? ), and I knew that I just had to make a visit. B2W isn't open on weekends, and it's a bit out of the way for me, but I managed to pop in this morning at ten-thirty (my reward for coming in to work for an early-morning meeting and missing my usual breakfast at home!) It was a good time to visit - no queues! My fears of hassled staff were unfounded too - they were super nice. They must have seen my confused, overwhelmed face when I walked in, and one of the lovely staff promptly explained their ordering system (table service if you eat in, order at the bar for takeaway), the different bagel varieties and cream cheese schmear flavours, and which combos go together well. 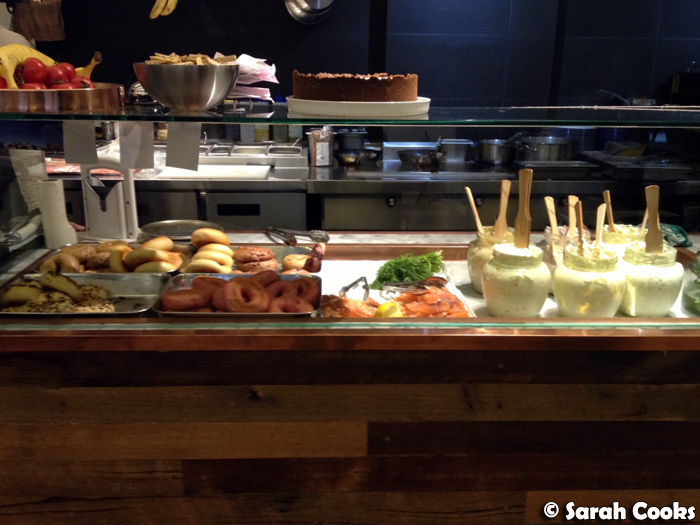 (There is a big sandwich menu on one wall, but I was much more interested in the bagels). I chose (drum roll please).... an onion bagel with cold-smoked salmon and a schmear of dill cream cheese. Yes, you can get hot-smoked salmon too, but the cold-smoked was sliced in these gorgeous thick pieces and looked too good to resist. (N.B. "cold-smoked" and "hot-smoked" here refer to the method of smoking the salmon, not the temperature at which it is served - they are both cold). It was incredible! The bagel itself (from 5 and Dime) had little crunchy onion pieces all over it, and an addictive layer of sea salt flakes on the top (think German pretzel, but not as chunkily salty). They were generous with the cream cheese, and the thick pieces of smoked salmon were so luxurious - a real treat. Speaking of treats, though, I felt it would be a bit too much to have a peanut butter hot chocolate as well, so I'll have to try that another time. I'll just let you know, inspired by the B2W peanut butter hot chocolates I've been seeing posted on various blogs and Instagrams, I actually made my own at home on the weekend, and loved it! I have no idea how it compares to B2W's version, but I was extremely happy with mine, and I'll be posting the recipe here in the near future. One of the six cream cheeses available is peanut butter cream cheese. Woah. So perhaps a double peanut butter breakfast is on the cards very soon! I love that word schmear-it's perfect to describe it completely. 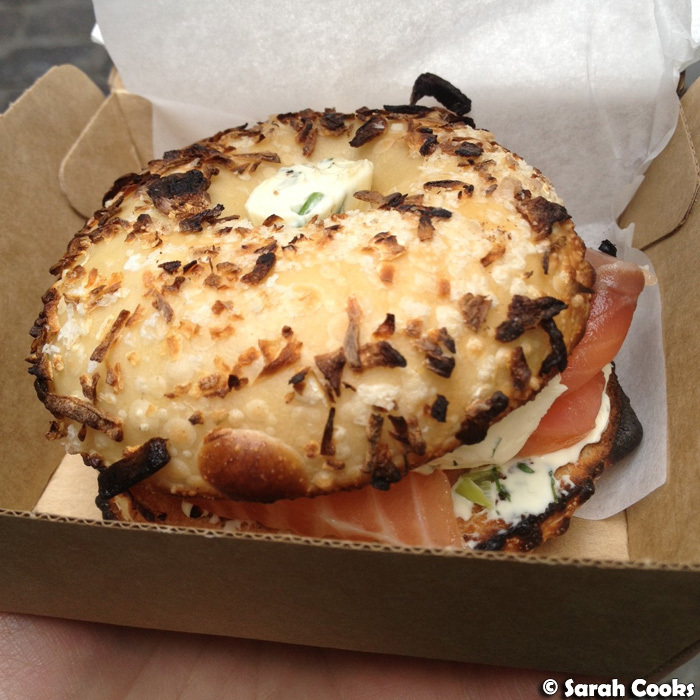 We've got a few bagel places here starting up-interesting to see how authentic they are too! P.S. I'm also keen to find out if your peanut butter hot chocolate is the way I make mine... melt peanut butter, chocolate, milk, vanilla, and a pinch of salt together, wheeee! I need need need to get down to B2W soon! Can't wait to stuff a bagel in and try that PB hot choc! I have never heard of this place or this lane! MUST VISIT!